When I was a kid, our neighbor, Wilbur Pickett, made hot sauce on an open fire on the vacant elementary school-yard between our McComb, Miss., houses. I didn’t think too much about why until years later when I made my first batch of garlicky dill pickles from garden cucumbers – and stunk up my house without the possibility of parole. Luckily, I’d acquired a small, bottle-gas burner for football tailgating. From then on, I cooked my pickling juice out on the porch to avoid the penetrating aroma. It’s mighty good in the jar, but it’s a bit something to take into your nose when it’s steaming hot. It also infuses itself into drywall (just my opinion – not a scientific fact). Now I know why Wilbur’s wife, Gladys, sent him to the school yard for his vinegary concoction. This recipe for giardiniera mimics those fancy, expensive pickled veggies in the grocery but is easy to make at home. It makes a pretty gift for friends, too. Try it. Lazy summer/fall days call for a picnic with friends, especially at dusk when things cool off a little bit. Plus, this is a budget-friendly form of entertainment. We keep a blanket in our trunk so we’re ready to go at a moment’s notice. And no need for a fancy spread if you are picnicking on a whim. A bucket of Popeye’s or a poboy is equally as festive as a basket full of homemade goodies, in our opinion. 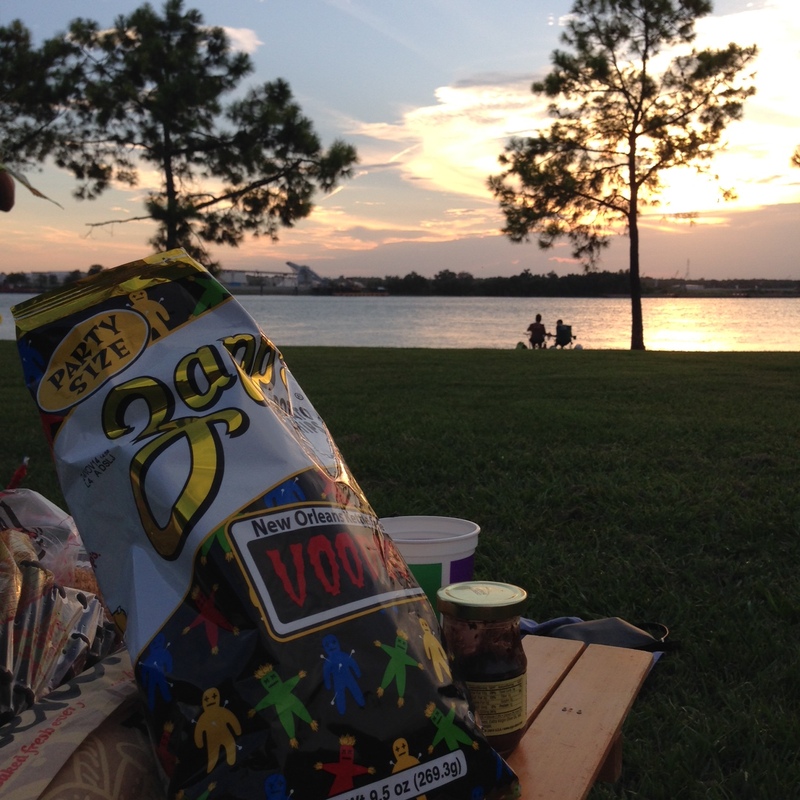 GoNOLA offered up suggestions for picnic destinations in New Orleans. Here are some of our favorite places to picnic in the city. Have another suggestion? Tell us in the comments. Summertime is Peach Time in the South. That’s time for peach cobblers, peach pies, peach ice cream and other delicious doin’s. A couple of years ago, I made a savory peach jam, which was a big hit with the folks I gifted it to. This chutney recipe is quite extraordinary and a bit different from your butter-and-jelly ways. You’ll love it. It also doesn’t contain any salt, for folks watching their intake. Try this as a last-minute grill topper on pork loin, chicken or veggies. It’s also a great condiment on the side or as a savory morning toast topper. Any way you like peaches, this works “mighty fine,” as we Southerners say. Header image by NaJina McEnany and used under a Creative Commons license. 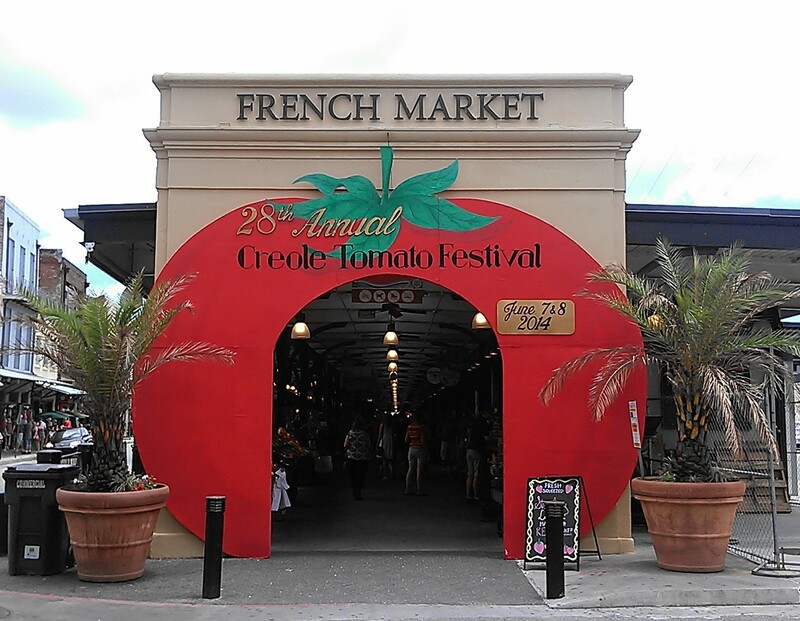 The French Market held its 28th annual Creole Tomato Festival last weekend in New Orleans. 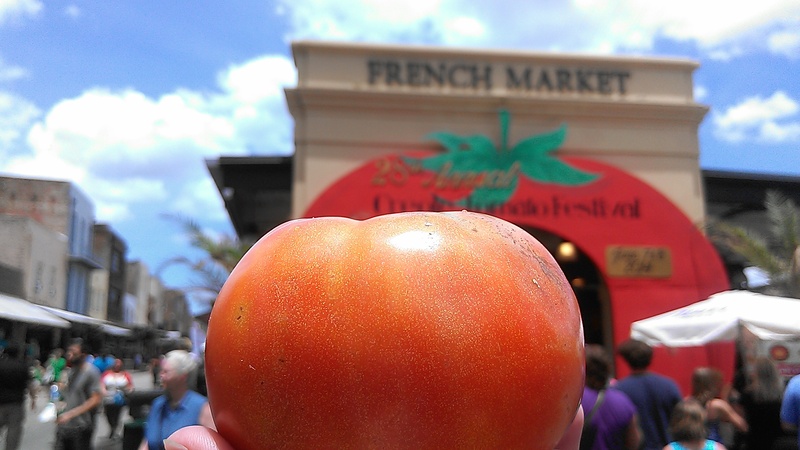 We tried the famous tomatoes, watched a Creole tomato-eating contest and ate some yummy tomato dishes. Check out our food photos here. We filled our belly June 1 at the New Orleans Oyster Fest (first-timer tips). 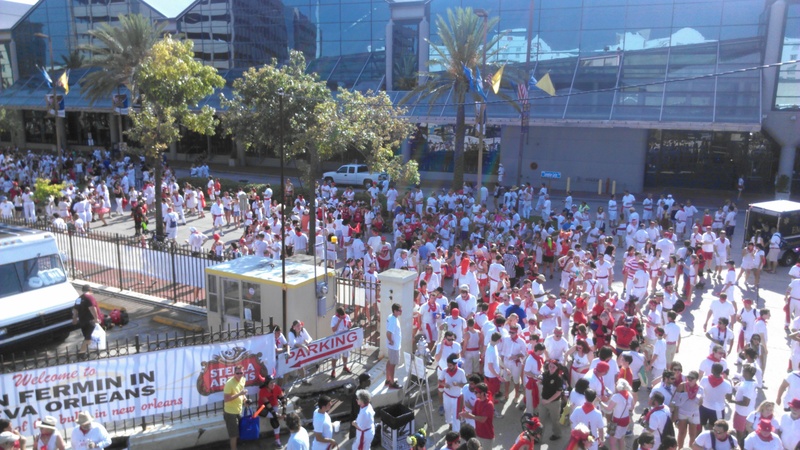 The food-centric fest was held in downtown New Orleans at Woldenberg Park. Fav part – free admission. The day started with an oyster-eating contest in the rain was rounded out with sunshine and food. 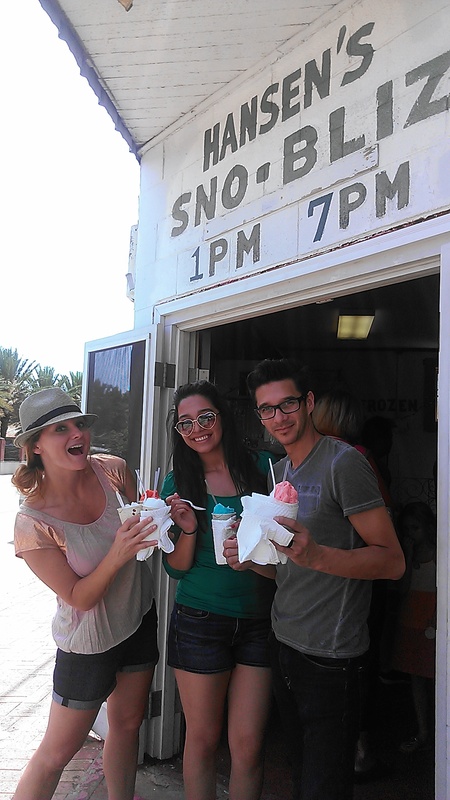 Check out our Storify post for food pix from the fest. In a Half Shelf blog also has a spectacular photos and tips. Check them out. Summer storms are a way of life in New Orleans. It’s not uncommon for it to rain in the metro NOLA area every day. Expect 15 to 30 minute afternoon showers. Plan ahead and stick a mini umbrella in your car, purse or backpack. And don’t let the weather ruin your plans. New Orleanians are used to the rain and many events go on, rain or shine. Buy a pair of rainboots (Fleurty Girl options) and hit the streets. Also, don’t stress about the severe weather/flooding alerts on your phone. Sure, you need to pay attention and be weather-alert, but the alerts are common so there is no need to panic. UNLESS you see rising water or tornado like winds. Just be smart, people. Every Southern girl knows – you need at least one rockin’ hat for summer. Hats are about more than just having great style in the hotter months – they’re downright practical!